Expo Shanghai Online, an innovative feature of Expo 2010 Shanghai, will officially go live on May 1, the Bureau of Shanghai World Expo Coordination announced on Thursday. The bilingual website, www.expo.cn, which appears in both English and Chinese, offers a 3D virtual tour of the Expo Garden as well as an interactive role-playing game, The City of the Future. Both the virtual tour and the game are free of charge, though users will need to download an installation package before they can use the services. Expo Shanghai Online provides the first-ever virtual tour of a World fair. "Expo Shanghai Online is a revolutionary creation in the history of world exhibitions," said Vicente Gonzalez Loscertales, secretary-general of the Bureau International des Expositions. 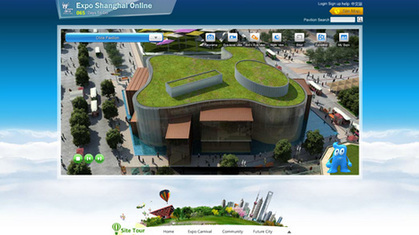 Since the trial version of Expo Shanghai Online appeared on Nov 12, 2009, 25 million users have taken the online tour. The official version of Expo Shanghai Online is more diverse and attractive than the trial one, said Zhu Yonglei, deputy head of the Bureau of Shanghai World Expo Coordination. In the virtual tour of the Expo Garden, visitors will be able to observe the appearance of 152 architectural structures, explore the inside of more than 200 exhibition halls and experience more than 100 interactive displays, Zhu said. Online visitors can also gather stamps from hundreds of pavilions on an Expo passport, a popular innovation of Expo 67 Montreal. In contrast to the difficulty of queuing to gather a collection of stamps in an actual Expo Garden, the ease of clicking on a site to collect stamps is regarded as one of the advantages of Expo Shanghai Online. With the interactive online game The City of the Future, users can converse with celebrities, including basketball player Yao Ming and actor Jacky Chan. The game server is capable of allowing 10,000 users to be logged in at the same time, enabling players to form squads and fulfill assignments to win prizes, including admission to the actual Expo Garden and Belgian chocolate. Tencent and China Telecom, technical supporters of Expo Shanghai Online, said they are able to guarantee safe and stable service for visitors to Expo Shanghai Online.